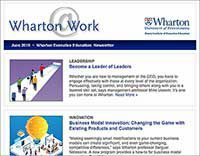 Contributor: Sigal Barsade, PhD, Joseph Frank Bernstein Professor of Management, The Wharton School, University of Pennsylvania. Create an environment that enhances employee engagement and performance by paying attention to the emotional contagion occurring in your team. Employees are not emotional islands. Rather, they continuously spread their own moods and receive and are influenced by others’ moods. When they work in groups, they literally can catch each others’ emotions like viruses, a phenomenon known as emotional contagion. These effects become even more powerful in stable workgroups where there is greater work interdependence. Executives can use their knowledge of the impact of mood contagion to create more positive team dynamics, increase performance, and decrease turnover by consciously managing their own emotions and the emotions they want to spread in their teams. As positive emotions have most often been found to lead to better employee attitudes, creativity, and job performance, leaders will likely want to elicit positive emotional contagion within the team environment. Negative mood contagion may be sometimes necessary to achieve a specific team goal, but should be relegated to short-term situations. For example, team leaders may want to elicit shared feelings of frustration or anger in cases where teams have lost to a competitor or have not met their goals; or they may want to induce feelings of legitimate fear when getting teams to understand organizational realities and accept why a change effort is important. Because employees pay great attention to their leaders’ emotions, leaders can strongly influence the mood, and thus attitudes and performance, of their teams through emotional contagion. Be consciously aware of your own mood. If it’s not one that will be useful to your team, change it. To get in a more positive mood, take one minute and imagine a past situation in which you felt really positive or a future situation that would make you very happy. Also, change your facial expression to the one you would have if you were happy — even if you don’t feel it in the moment, research consistently shows that your mood will follow your facial expression. Use your nonverbal behaviors to communicate emotional contagion. As most emotional communication occurs through body language, facial expression, and tone (with less than 10% communicated through words), pay attention to your body language as you communicate your emotions. For example, you may be crossing your arms because you are cold, but the people observing you will likely believe you are defensive or angry, automatically mimic your arm crossing, and begin to feel that way. Make direct eye contact with everyone on the team. Focus on spreading your positive emotional contagion to others on your team. Team members are most likely to catch your emotions when they look at you directly. You can help them do so by initiating eye contact. Neutralize a negative team member. Being aware that emotional contagion exists can help inoculate you against a negative team member. Talking to a negative person can help; people often don’t realize how negatively they are being perceived, or how their negative emotions are influencing the team. When team members are being intentionally negative, determining and discussing the source of the negativity can be helpful. If these steps don’t work, avoid sharing your gaze more than necessary in meetings with negative people. This will decrease the chance of catching their negative emotions subconsciously through mimicry of their facial expressions and body language. Create a positive emotional culture within the team. Emotional culture consists of the symbols, norms, values, and basic assumptions team members have about emotions that are acceptable to express and those that need to be suppressed in the team. As research has shown that more anger is expressed at work than happiness and joy, be sure to create an environment in which positive emotions are not only allowed but encouraged. Making it clear that destructive negative emotions and the behaviors that come with them — such as bullying, back-stabbing, and incivility — will not be tolerated can help create an environment in which they are less likely to occur, take root, and spread. Creating a culture of caring and compassion has been very successful for Southwest Airlines. Part of its strategy is attracting positive people — hiring through ads such as “When we feel good, It’s contagious,” and creating a culture of caring and compassion for their employees. Doing so has helped Southwest maintain ongoing profitable growth in an industry that has been plagued with financial challenges for years. “Why Does Affect Matter in Organizations?” Sigal Barsade and Donald Gibson, Academy of Management Perspectives, 36-59, Feb. 2007. How employees’ moods, emotions, and dispositional affect influence critical organizational outcomes such as job performance, decision making, creativity, turnover, prosocial behavior, teamwork, negotiation, and leadership. “The Ripple Effect: Emotional Contagion and Its Influence on Group Behavior.“ Sigal Barsade, Administrative Science Quarterly, Vol. 47, 644-675, 2002. Found that emotional contagion exists at the work group level, and showed the influence of four different types of emotions on group processes including cooperation, conflict, and negotiation outcomes. Emotional Contagion. Elaine Hatfield, John Cacioppo, and Richard Rapson (Cambridge University Press, 1994). This book describes many situations involving emotional contagion, and goes into detail about the behavioral mimicry and synchronization mechanisms that underlie this phenomenon. The authors also offer practical suggestions for how to best influence others’ emotions. “Implicit Affect in Organizations” Sigal Barsade, Lakshmi Ramarajan, and Drew Westen. In B. Staw and A. Brief (Eds), Research in Organizational Behavior, 135-162, 2009. People are often not consciously aware of the emotions that influence their beliefs, motivations, and behaviors or of how they regulate their emotions to protect themselves from negative emotions or enhance positive emotions. This paper examines affect in organizational behavior and the implications of making the implicit explicit. “Evidence of Mood Linkage in Work Groups.” Peter Totterdell and colleagues. Journal of Personality and Social Psychology, Vol. 74, 1504-1515. Examines how emotional contagion flows through work teams of accountants and nurses. 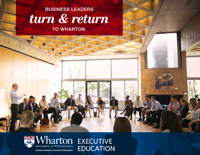 Sigal Barsade is the academic director of, and teaches emotional intelligence in, Wharton’s High-Potential Leaders: Accelerating Your Impact program. She also teaches in Leading Organizational Change.